When it comes to the major OSes, Chrome is clearly the last thing on many developers minds, and that is reflected in the paucity of reading apps for Chrome. Following my post yesterday on turning an Android tablet into the ultimate ereader, I took a look at writing a similar post for Chrome. Alas, that's just not possible. While there are a few ebook and other apps, the vast selection found in Google Play simply isn't available in Chrome. But there are some apps and extensions, and here's what you can do to read on Chrome. Or rather, this is what I found in the Chrome web store and elsewhere which is compatible with my Chrome browser. I don't have a Chromebook so I can't confirm how well the following works on one. And even though I haven't tested this on a Chromebook, this post should still be useful because it includes a number of out of the box solutions. Update (16 April 2016): I now have a cheap Chromebook, so I have gone through this post to add details, delete mentions of apps which no longer work, and make sure that all of the recommendations are valid. To start, let's look at Android apps. Android is Android and Chrome is Chrome, but did you know that you can install some Android apps on Chrome? Only a handful of Android apps, including Pocket and Feedly, have this option but more are being added all the time. You can find Chrome-compatible Android apps in the Chrome web store. And for those feeling adventurous, there is also a hack for running any Android app on Chrome. I haven't tried it, but I did find instructions on how to pull it off. There's also a Nook web app, but it's so awful that I won't list it here. Update (16 April 2016): The Nook web app died when B&N launched its new website. At this time I could find but a single option for reading library ebooks on Chrome: OverDrive. Update (16 April 2016): There's also the Biblioteca Cloud Library app (formerly 3M Cloud Library). It does not work in the Chrome browser, but it is compatible with my Chromebook. There's a similar shortage of audiobook apps, but you do have a few options. You can try streaming from websites, and there is also a 3rd-party app for Librivox. Also, Downpour.com has no DRM so you could simply download audiobooks there and play them in a media player. Thanks to Scribd and Oyster's support for any web browser, you should be able to use those services with Chrome. Kindle Unlimited, on the other hand, may or may not work with the Kindle Cloud Reader. Chrome should have the ability to open a PDF baked in, but if it doesn't then check out Notable PDF or MetaPDF. Here are a few of the feed readers you'll find in the "news reporting" category in the Chrome web store, but for this type of service you might be better off using the web browser version of these apps. While you a few options do show up in the search results for digital comics and manga, there aren't very many. Comixology, for example, will need to be read on their website. All in all, if I were going to pick a reading platform today I would not choose Chrome. Trying to find the details in this post was frustrating enough to make me go back to Android; I can't image what Chrome would be like to use on a daily basis. Note that you can run some Android apps on Chromebooks now with a hack, and Google wants to make it so that all Android apps run on Chromebooks without the hack being necessary but that will take longer. Yep. That’s why I mentioned the hack first. I’m glad you’re starting to cover Chromebooks, Nate. I think they are a “sleeper” product which will become more and more popular as people realize how convenient they are for the 90% most common uses (email, watching videos, browsing the web, writing, minor image editing). The use of Chromebooks has really take off in schools, and I can see them becoming very popular with seniors. For me the key advantage is that they are practically no-maintenance and virus-free. I’m an enthusiastic user of Chromebooks (I have two), but I don’t really want to read ebooks on them – for the same reason that I don’t like to read ebooks on any laptop. The form factor is awkward, and it tires my eyes to be looking at a bright screen for hours. Tablets and e-readers are really the tools of choice for e-reading (yeah and smartphones too I guess, especially the phablets). I do have several of the apps you mention running on my Chromebooks: Readium, Google Play, Kobo, Kindle, Pocket and NYT. They all work fine. Even though I don’t use the Chromebooks much for reading, they are good for re-arranging things within those applications, for example, adding tags to articles in Pocket. What I’d really like to see on Chrome are tools for ebook organization (e.g. Calibre) and creation (e.g. Jutoh). I also think Chromebooks could do well in other institutional uses: businesses, college computer labs, and anywhere else that a controlled function device is desired. And as for reading on one, I read on my laptop. I actually like reading books on my laptop; the large screen lets me scan text a lot faster. I wouldn’t be surprised if I were in the minority when it comes to ebooks, but I bet I’m not the only one to read in a news reader, or listen to audiobooks, on a laptop. I’d like to see comparisons of chrome-books with so-called Windows capable chrome-book killers. At the low price-points, they’re something a lot of people are watching. As far as I can see, a chrome-book will do less than my Android tablet, except have a keyboard. I suppose it’s all about the keyboard, which is fair enough. But with limited functionality, can a chrome-book do enough make the keyboard worth having. They’re pretty crappy keyboards from what I can see anyway. To some extent, it depends if they can be re-configured. You can install Linux on it, I suppose, but then why not just buy a chrome-book killer and have access to the much wider choice of Windows software? For one thing, Android was not originally intended to be for tablets any more than Chrome was intended to be an OS. One was a smartphone OS and the other was a web browser. But more importantly, I would argue that the question “can a chrome-book do enough to make the keyboard worth having” is looking at things from the wrong direction. Chrome exists for things like office tasks, email, and other tasks which require a keyboard. I would say that the better question would be to ask why you would go a step down from a full OS like Windows to a half-OS like Chrome. That I don’t understand. Price. But chromebook killers are coming. I don’t think it is a good idea to compare Windows laptops with Chromebooks. The false assumption is that the two are the same sort of beast, and that you can compare them with the simple parameters of price, CPU speed and storage. Chromebooks are built on a different paradigm of computer use. Storage and processing occurs (mostly) in the Cloud. Because Chromebooks only have to run a browser, the machine can be optimized for that task so that they perform well with minimal hardware. That makes them inexpensive. From my point of view, the biggest advantage is the lack of hassles. They update themselves automatically and quickly. Viruses and malware are very uncommon, because of the architecture of the system. And the system is easy to learn, because everybody is familiar with browsers. So for the 95% of the applications that most people run most of the time, it is a brilliant approach. The thing is, Chromebooks and Winlaptops occupy the same slot. I’m only going to carry one or the other so it is reasonable to compare them. That’s just it, Nate, they are very different slots. If one can “live in the Cloud,” using online apps (especially Google apps), then Chromebooks have big advantages. If you have to run applications locally (high quality video editing, for example), then they are a no-go. 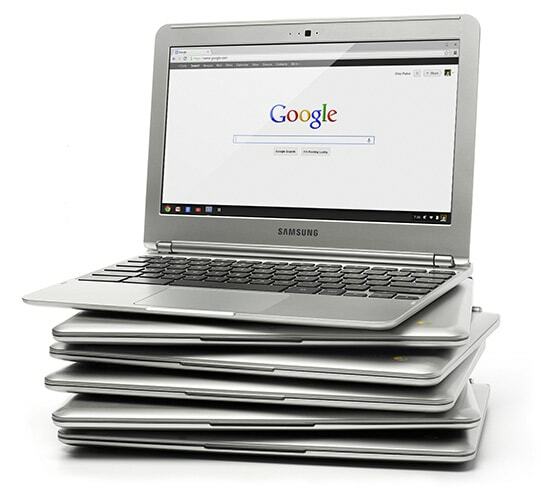 Some people keep a fully featured computer at home (laptop or desktop), and take an inexpensive Chromebook for light use or when they go out. Chromebooks are also good for non-technical spouses, relatives and children. A brother-in-law is visiting? Give him your Chromebook, and he can log on with his own Google account or use a Guest account. Your files will not be affected by what he does. BTW, I didn’t realize that people could happily read on their laptops. Just goes to show that one shouldn’t generalize from one’s personal experience! isn’t it a co-incidence that bn’s web reader went bye bye coinciding with their pay out for the credit for free ebooks due to that lawsuit settlement? I have $116 in credits i can’t use. I think that’s total you know what. just a way for them to get around paying it out. i’m going to order the books in print just to make sure i spend all the credits. Google recently announced that recently made Chromebooks, within the last year or so, will be able to run Android apps. This will add many more e-reading options.